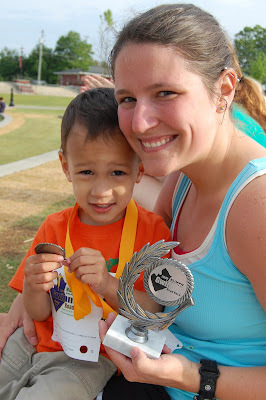 So, Anakin and I had our first official race together... Ok. Not really together because let's face it: he's not ready to pump out 3 miles, but at a 5k I ran in, they also hosted a little quarter-mile "fun run" and for $10, he got to "race" (there were no winners), got a medal, and also got a tshirt that won't fit him for a few years. So, it was worth it all the same. 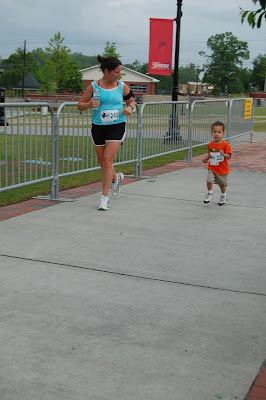 I beat my last time by a ton, clocking 27:03 and winning my age group. I got a nifty little trophy, a shirt, and a water bottle. Rock on. Congratulations! 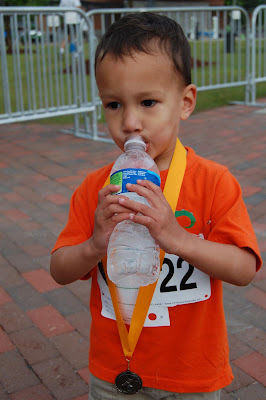 I have always wanted to do a 5K, but I've never had the nerve. You make it look fun, though! good job! under 30 min is great. and you look great, by the way. i'm glad we got to catch up on the phone the other day, too.